We met up with friends at Mercato @ Daylesford for a bit of a special lunch. There were 6 of us, but 2 couples in our party had not met before – we were the common denominator. This is always an interesting social occasion – new acquaintances sussing each other out and testing the waters. David, our waiter, ensured that every moment that required input from the restaurant was catered to at the exact moment we needed it – that cardigan and shopping bag and other paraphernalia with our staggered arrivals? Sorted!…a return of the wine menu after our aperitifs? Only had to think this thought and it was there!…More delicious, warm, snug bread rolls? Timed beautifully between courses. The food was delicious, and it was nice to see some very inventive dishes for the vegetarians in the party, as well as the carnivores. We had an entrée of Meredith goat cheese filled zucchini flowers in crisp tempura, tomato salad, black olive crumb, followed by a main of spiced tofu, chia & pumpkin croquettes, steamed broccolini, eggplant, zucchini, broad beans, white bean puree. The sides provided a lovely accompaniment for those needing that little bit extra, and we chose roasted pumpkin, Persian fetta, pine nuts, thyme, as well as one of steamed beans, toasted almond. The Bellussi Prosecco di Valdobbiadene was a light aperitif before the meal, and with everyone wanting a red to accompany the food, the bubbles were followed by Blackjack Block 6 Shiraz 2006 from Bendigo. The restaurant itself is a lovely, welcoming old house, with white walls home to numerous works of art…some more attractive than others! The atmosphere created by the décor and staff is one of laid-back elegance. Impeccably timed service with professional style and friendliness, and delicious, satisfying food makes this a delightful place to have a summer lunch with friends. 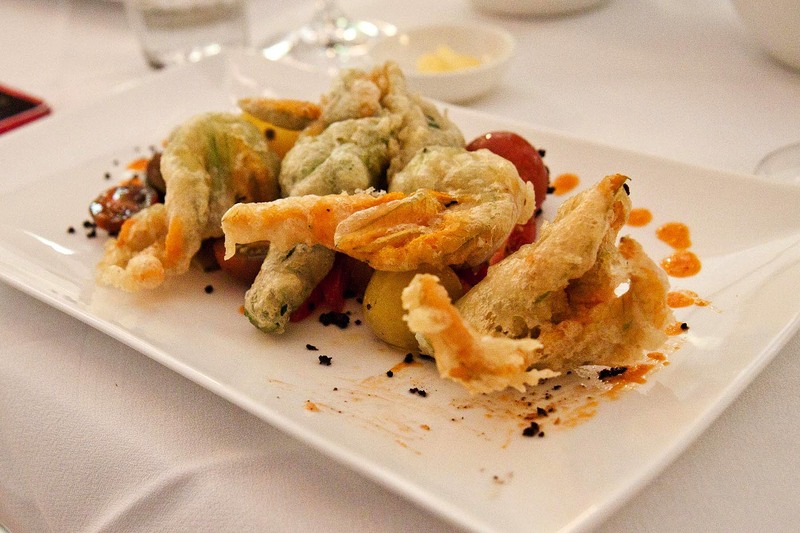 This entry was posted in Australia, Australia Restaurants, Restaurants, Victoria and tagged Daylesford, Macedon Ranges, Mercato, summer lunch with friends, Victoria by bontaks. Bookmark the permalink.